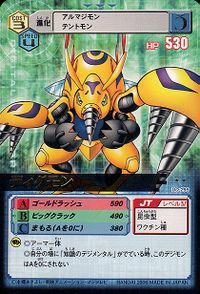 An Armor-level Insect Digimon which evolved through the power of the "Digimental of Knowledge". The "Digimental of Knowledge" has the attribute of "Earth", and those that don this Digimental wield the power to manipulate the earth. As can be seen from its unique form, it never loses to any Digimon in underground battles. Its Signature Move is impacting the ground with its spinning drills, causing a fissure (Big Crack). 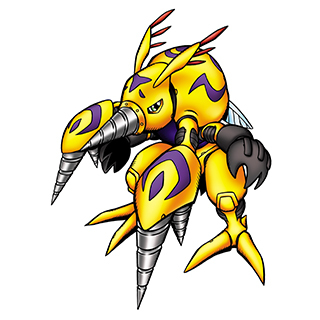 Its Special Move is rapidly spinning the drills on its snout and both of its hands, performing a simultaneous attack with its drills (Gold Rush). 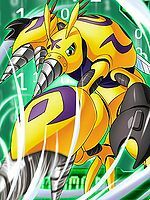 An Insect Digimon that evolved due to the Digimental of Knowledge. 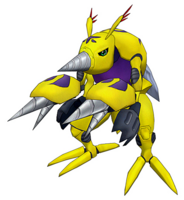 Special Move - rapidly spins the drills on its snout and both of its hands, and performs a simultaneous attack with its drills (Gold Rush). An Insect Digimon that Armor evolved from Armadimon with the Digimental of Knowledge. It is able to freely move underground using the drills on its snout and both of its hands. Its Special Move is firing its drills like missiles (Gold Rush). 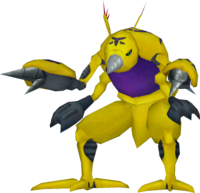 An Insect Digimon who is unbeatable underground. Its Special Move is a simultaneous attack with its drills (Gold Rush). Title: 「鋼の叡智」 — "Steel Knowledge"
Fires all its drills at the enemy at once. Big Crack  ビッグクラック Biggu Kurakku Rock Cracking/Powerful Cracking Drills into the ground and splits it open. Titan Drill  タイタンドリル Taitan Doriru Titanic Drill Rams the enemy with the drill on its nose. 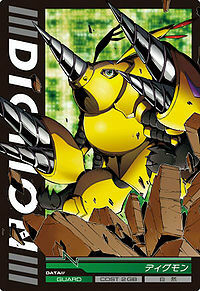 Digmon is the partner of Hida Iori and the armor evolution of Armadimon, evolving using the Digimental of Knowledge. In "Rush into the Digital World! 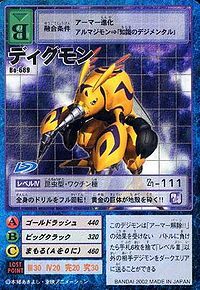 Drimogemon's Trap", an aggressive Drimogemon "slide evolves" into Digmon when cornered by Daimon Masaru and Thoma H. Norstein at the end of a lengthy chase between worlds, and is eventually defeated through the combined attacks of GeoGreymon and Gaogamon. 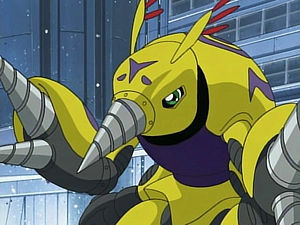 With regard to this Digmon's evolution, no Digimental was shown, so it cannot be qualified as an "armor" evolution, nor does it count as a regular evolution due to the fact that both Drimogemon and Digmon are classified as Adult-level Digimon. Using the Digimental of Knowledge, the player can call upon Digmon to help them travel the Underground Circuit Board under the networks, allowing quick (sometimes) access between different areas and even the two Servers. It can be evolved from Drimogemon at level 11. 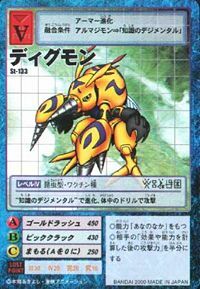 Furthermore, it can be obtained by evolving Armadimon (Jogress Line) through the Digimental of Knowledge at level 35. Digmon is only obtainable as a collectible card. Its card is part of the Digimental of Knowledge (知識のデジメンタル Chishiki no Dejimentaru) set. Digmon is available as a Digimon Medal. It evolved with the Digmental of Knowledge and attacks with the drills that cover its body. The drills all over its body go full rotation! Its large, golden body breaks through the earth's crust! The Armor Evolved form of Armadimon using the Digimental of Knowledge. Possessing the earth element, it skillfully wields the drills on its nose and arms, allowing it to excel in underground battles. 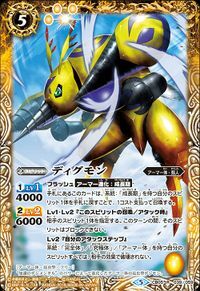 An Armor-level Insect Digimon which evolved through the power of the "Digimental of Knowledge". ↑ Digimon Savers: "Rush into the Digital World! Drimogemon's Trap"
This page was last modified on 18 March 2019, at 22:20.